Most of us eat bread pretty regularly. Whether it’s covered with strawberry chia seed jam for breakfast, holding together a bbq cheddar chickpea burger for lunch or in the form of homemade Panko-style breadcrumbs used to make a healthy chicken parmesan for dinner. Unless you’re actively avoiding it, bread probably plays a big role in your daily diet. And now you’ve got your hands on an out-of-this-world-amazing healthy whole wheat bread recipe, you’ll never need to rush to the store and settle for an okay-ish loaf full of chemicals and nasties for as long as you live! I’ve started watching repeats of the Great British Bake Off again. I’ve seen all the series about 4 times now! And whenever I watch it, I always end up in a baking frenzy. Last week I made a loaf of the most incredible smoked cheddar and caramelised onion bread. It tasted beyond delicious, but it wasn’t exactly healthy. This basic whole wheat bread recipe on the other hand definitely is. It contains just a tiny amount of brown sugar and heart-healthy olive oil. It’s also got a 50-50 ratio of all-purpose and whole wheat flour. So you get lots of filling fibre while still having a light and chewy loaf. 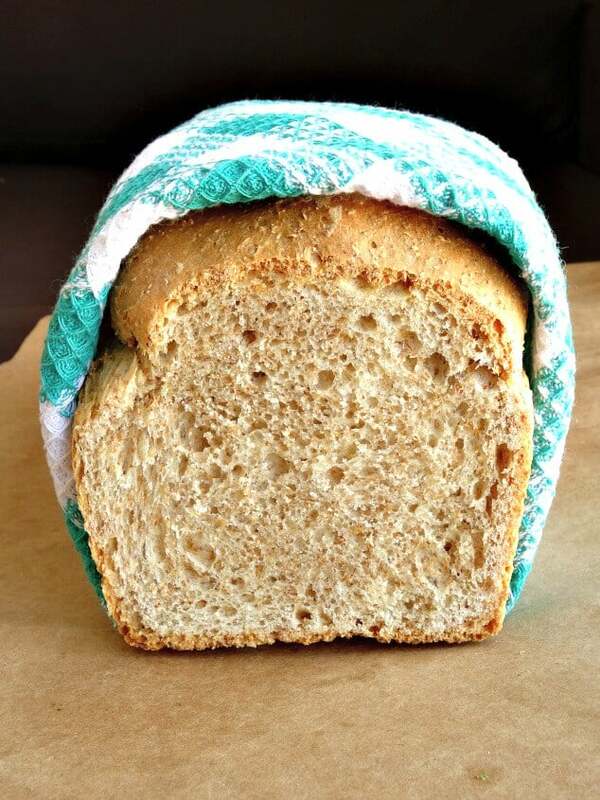 It’s so much easier to make your own healthy homemade whole wheat bread than you probably think. Yes, this recipe does take 4 hours to make from start to finish. But less than 1 hour of that is active time! And putting a homemade loaf of bread on the table you’ve made entirely yourself 100% from scratch without any cheats or weird ingredients has got to be worth a few hours of your time, right? Better still, this recipe makes 2 loaves, so you can serve one up the same day you make it and freeze the second one for later on in the week. If you don’t go through much bread, you can even cut the loaf into slices, pop the slices into a Ziploc bag and freeze them individually. So the next time you’re craving a sandwich or some toast, you can just pull 1 or 2 slices of bread out the freezer instead of having to defrost a whole loaf. Can you make homemade bread without sugar? Rarely do you ever come across a healthy recipe that contains sugar, right? But this healthy whole wheat bread recipe does. It works out at something like 1/4 of a teaspoon of sugar per slice, which is practically nothing. But still, if you’re trying to cut down on your sugar intake, you might be wondering – can you make healthy homemade bread without sugar? And sadly the answer is ‘no’. Well, not this recipe anyway. 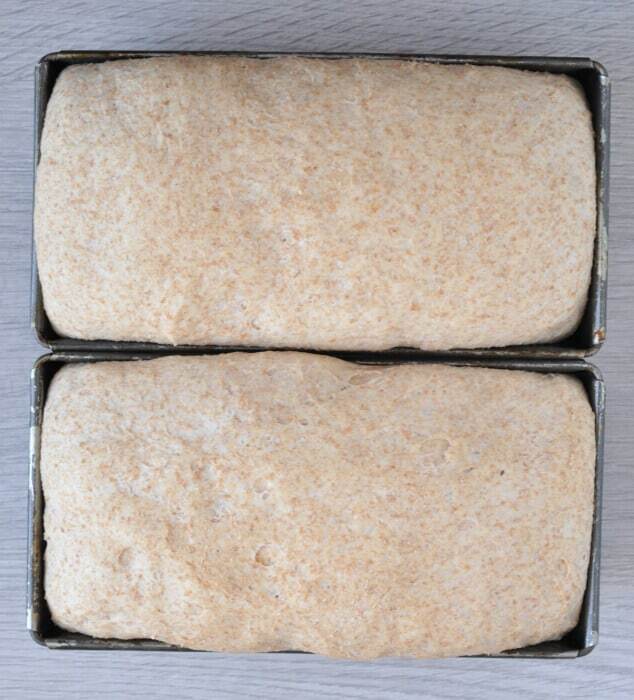 The sugar is 100% necessary to feed the yeast so it activates and does a great job of creating a light loaf. If you didn’t use sugar, there wouldn’t be anything to feed the yeast and you’d be left with a brick. There are some types of bread that don’t use sugar, but they take forever to rise because they don’t use yeast either. Which bread is best for weight loss? Here’s something all you carb-lovers out there will be happy to hear – you can eat bread and still lose weight! You’ve just got to be careful about which type of bread you choose. 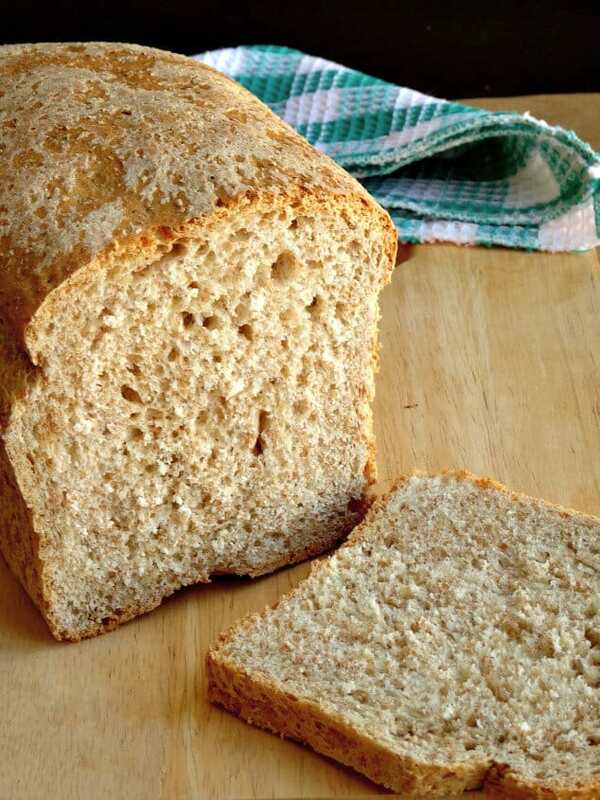 Avoid empty-calorie loaves made with all-purpose flour and instead opt for healthy whole wheat breads like this one. All the added fibre will help keep you full so you’ll lower your calorie count without even trying by not snacking. This isn’t the only healthy whole wheat bread recipe out there. The internet is full of them! Click here to sign up for my newsletter and you’ll get instant access to my top 10 favourite healthy bread recipes. There are so many awesome ones on the list. I just know you’ll love trying them all! Improved digestion. The fibre in whole wheat bread not only helps you feel fuller for longer, but also promotes a healthy digestive system which reduces your risk of colon cancer. Lower cholesterol. Whole wheat bread helps to prevent your body from absorbing bad cholesterol, lowering your risk of heart disease. Lower blood pressure. Eating whole grains substantially lowers your levels of triglycerides, insulin and blood pressure – another three things which can cause heart disease if they’re high. Redistributed fat. Whole wheat bread cuts down on the fat around your middle section and redistributes it evenly throughout your body, reducing your chances of developing diabetes. Improved immune system. Just like fruits and veggies, whole wheat bread is filled with essential minerals which your body uses to fact bacteria and disease. Can you put undercooked bread back in the oven? If you’ve ever asked this, you’re a person after my own heart. The answer is yes, yes and yes! Before I got good at bread baking (please excuse my inflated ego!) I used to pull my loaves out of the oven way too early. You know when that freshly-baked bread smell hits you and you just can’t resist any more? That was me all the time. 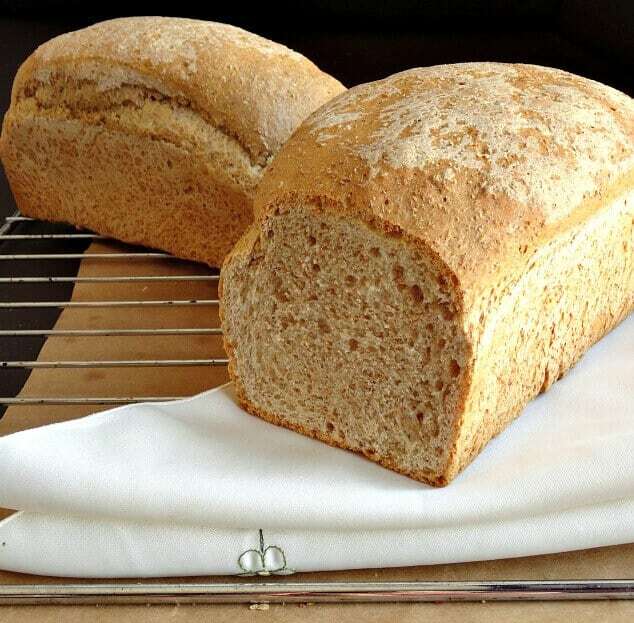 If you’re making this healthy whole wheat bread recipe and you remove the loaves from the oven too early, simply pop the loaves back in their tins and put them back in the oven at the same temperature. Give them another 10 minutes or so and check on them again. The best way to tell if the loaves are done is to remove them from their tins and tap them on the bottom. If you hear a hollow sound, they’re done. If you don’t, put them back in the oven. When the tops of the loaves are browning too quickly, just cover them with tin foil and return them to the oven. This way the dough in the centre will still bake, but the tops won’t burn. Make sure the water really is 110F-120F or 43C-49C because this helps the yeast bloom. The best way to do this is to use a baking thermometer. They’re super cheap and they take all the guess work out of it. Yeast blooms best when it’s in the dark. So follow my advice and cover your bowl with an opaque cloth or something that completely blocks out the light. 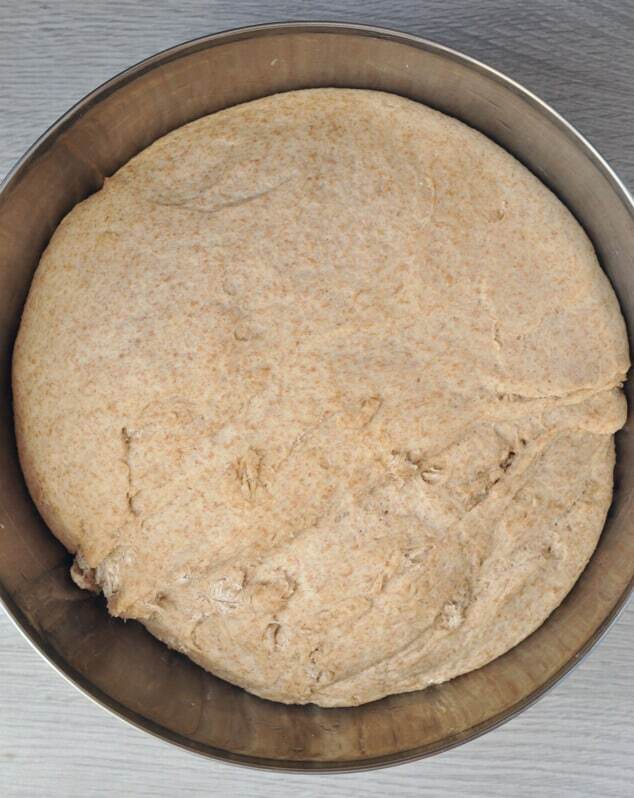 Leave the dough somewhere warm to rise. 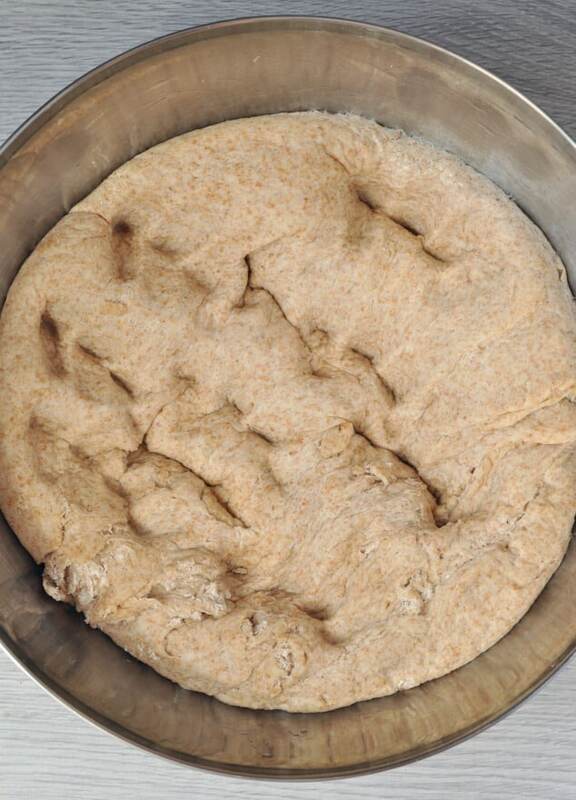 If you live in a warm place and it’s summer, you can leave the dough outside if it’s properly protected. By the stove when you’ve got something cooking and close to a radiator are 2 other great spots. Preheat your oven thoroughly. Set the temperature at 350F/175C and do not put the loaves in until it has reached that temperature! This helps ensure the loaves rise properly and get a wonderful crunchy golden brown crust. Don’t open the oven for at least 20 minutes once the bread is inside. The whole wheat loaves aren’t going to be ready for at least 40 minutes and if you open the oven door any earlier, you risk ruining all your hard work. Whether you’re a newbie baking bread for the very first time or an expert who makes it every week, here are some essential bread baking accessories that will make baking bread so much quicker, easier and more fun! A crisp, golden brown crust and the most amazing flavour-packed light and chewy centre. 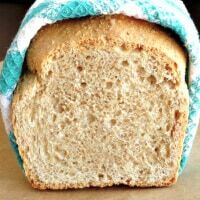 This easy healthy whole wheat bread recipe is a million times better than anything you'll get from the store or even a bakery! In the bowl of your electric mixer, stir together the water and brown sugar. Whisk in the yeast and cover the bowl with a cloth so the contents are in the dark. Leave to bloom for 15 minutes. 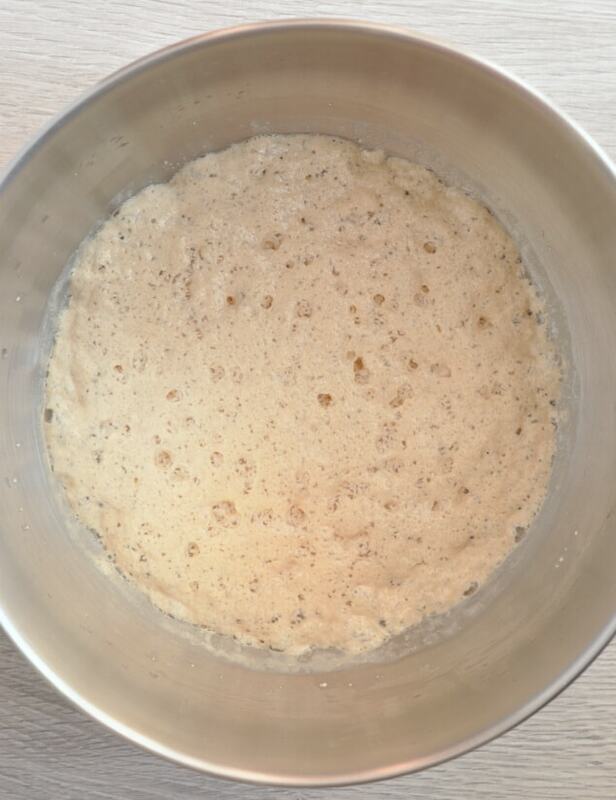 When the yeast has bloomed, stir in the salt, olive oil, egg and lemon juice until everything is blended together. Stir in the whole wheat flour then cover the bowl with a cloth again and leave to soak for 30 minutes. 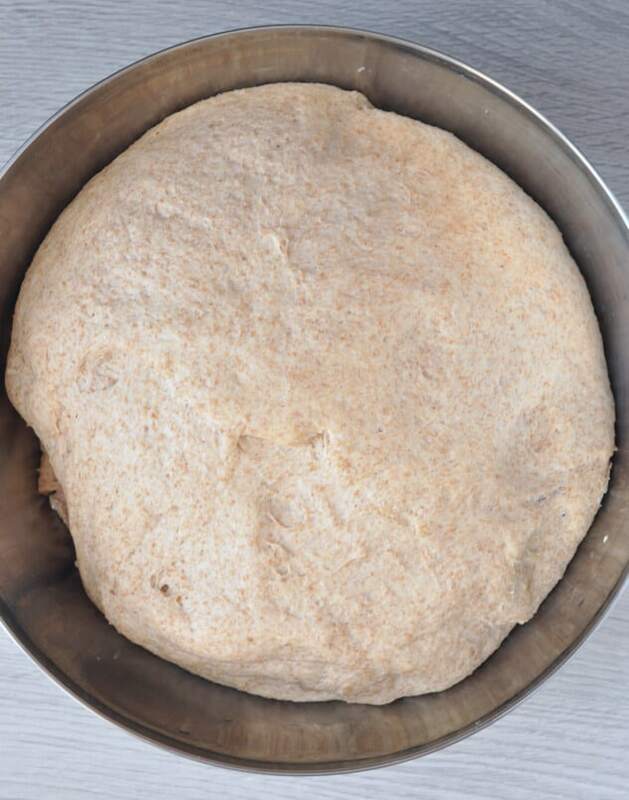 When the whole wheat flour has absorbed a lot of the liquid, stir the all-purpose flour into the bowl. Knead with the dough hook attachment for 7 minutes, until you've got a strong dough. You might have to add more warm water or all-purpose flour to get the right texture. Rub a little oil on the inside of a large bowl and drop the dough into it. Tightly cover the bowl with plastic wrap and leave to rise somewhere warm for 45-55 minutes, or until doubled in size. Punch the dough down and leave it to rise, covered, for another 45-55 minutes, or until doubled in size. Preheat the oven to 350F/175C and generously grease 2- 4" x 8"/10cm x 20cm loaf pans with butter. 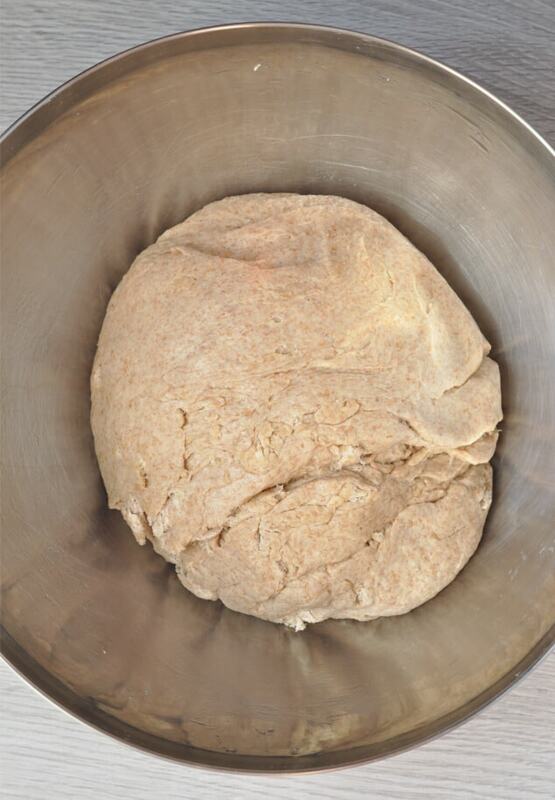 Punch the dough down again and evenly divide into 2. It's a good idea to use a set of scales for accuracy. Form each piece of dough into a loaf-shape (here's a short video tutorial that shows you how) and place them inside the loaf pans. 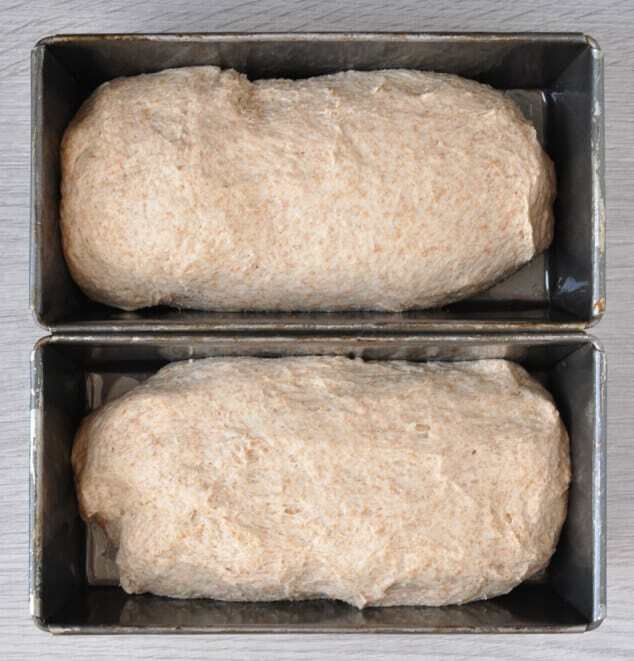 Lightly cover the loaves with a cloth and leave to rise in a warm place for 20 minutes, or until the tops of the loaves are poking 1 inch / 2.5cm above the sides of the tin. Bake the risen loaves in the preheated oven for around 40 minutes, until the tops are a dark golden brown and you hear a hollow noise when you tap the bottoms of the loaves. Remove the loaves from the baking pans and leave to cool to room temperature on a wire rack before slicing. This bread will keep at room temperature or in the fridge for up to 5 days. If you place it inside a Ziploc bag, it will keep in the freezer for up to 6 months. I have been looking for a 50/50 bread like this and had not found one that I liked until I tried yours. Absolutely amazing taste and texture! Stayed soft for at least 4 days! My kids loved it, too! I did not need to do the second 45 min rise and it still turned out beautiful! This will be my new go to bread recipe every week! Thank you so much for your kind words, Lynn! It’s great to hear about people trying my recipes and then loving them as much as I do. So happy I was able to give you and your kids something homemade and yummy to eat 🙂 Have a wonderful weekend! Thanks a lot for this recipe, I was in a bit of hurry so i didn’t let the dough rise the second time and it still turned out amazing and tastes great ???? That’s wonderful! Great to know it works well without the second rise. Thanks for sharing! Best bread Ever!!! I followed the recipe exactly as written. Delicious, moist perfect sandwich bread. Trying to transition from commercial flour to home milled, so the whole wheat was fresh home milled from organic hard red winter berries. Now if I could just figure out what to replace the bread flour with. Thanks a lot for the recipe. Just wondering if I can use light brown sugar or dark. Which one is best? You’re so welcome, April! I use light brown sugar, but there’s no reason why you can’t use dark. Choose whichever one you like the flavour of most 🙂 Have a wonderful Friday! Love this recipe. I am 63 years old and have never made homemade bread. I always assumed it was difficult. I am now retired and decided to give it a shot. So glad I did!! Recipe was easy to follow. My two loaves looked and tasted great. I will make again! This sounds wonderful! Will this work in a bread machine if I just cut the ingredients in half so that I only have one loaf? Can I leave the egg out or substitute with something else due to an allergy? I’m new to bread making! Hi, Tina! You could substitute the egg with 1/4 cup of applesauce. As for using a bread machine, I really don’t know. I’ve never used a bread machine before, so I can’t give you honest advice. Happy holidays! Are you using whole wheat flour or whole wheat bread flour? Thx a million for the recipe and the bread baking tips!! Several things I learned I was doing wrong. Now I know not to do next time. This recipe sounds fool proof and delicious, adding to to recipe box now.